Memoria y Resistencia: Close the School of the Americas! Sunday, January 27th marked one year since US-backed Juan Orlando Hernandez was installed for a second term as president of Honduras, in the midst of massive demonstrations against widely-recognized election fraud. It was the United States that first recognized Hernandez and ensured he remained in the presidency. A Miami Herald expose found that US-made M-4 weapons were used by the Military Police to kill 19-year old Kimberly Dayana Fonseca during last year’s demonstrations. Between 2015 and 2017, the State Department authorized companies to export over 10,000 firearms to the Honduran government. Over 35 demonstrators and bystanders were killed during the pro-democracy demonstrations. Dozens more were arrested and jailed; several demonstrators, including Edwin Espinal and Raul Alvarez, have now been imprisoned in inhumane conditions for over a year. Edwin and Raul are in a military-run maximum security prison where their health is deteriorating and they have lost over 40 pounds each. This past weekend as people across Honduras took to the streets demanding the resignation of Hernandez and freedom for political prisoners, the US-backed regime again repressed the population. According to human rights organization COFADEH, a Honduran TV camaraman covering the demonstrations reported that the US-trained and financed elite TIGRES shot a rubber bullet directly at his stomach because he was filming as security forces repressed the demonstrations. Security forces also detained journalist Jairo Lopez and dozens of demonstrators, fired live bullets, and beat up protesters. This occurred just days after US Vice President Pence called Hernandez to ‘reiterate’ US support for his regime and ‘commended’ him for the repressive measures imposed to try to stop those fleeing from Honduras. The Commander of the US Southern Command also choose to travel to Honduras and meet with the Honduran president last week, just ahead of the major demonstrations. WHINSEC, formerly known as the SOA, was also in Honduras in December. At a time when thousands of Hondurans are fleeing and calling for Hernandez to resign, the US is choosing to make it clear it will continue to support this violent and repressive regime. 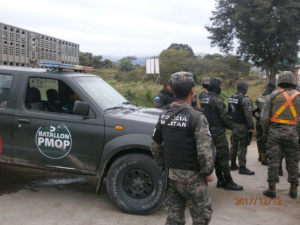 The migrant caravans departing from Honduras are the directresult of the last 10 years of repressive and destructive policies imposed by US-backed regimes following the 2009 SOA-graduate led military coup, which removed a democratically elected leader who had improved life for many Honduras. Many of those forced to abandon their homes are all too well aware of the political causes of the proliferation of murders, violence, and economic policies that have destroyed their lives. Members of the migrant caravans frequently denounce the Honduran president, shouting the slogan made popular during the massive resistance to the illegal re-election last year, Fuera JOH. As the Trump Administration demonizes immigrants and the caravans fleeing Honduras, it is important to remember that it is precisely US policies and US-backed regimes that have created the need for people to flee Honduras in the first place. The actions of US officials to vocally support, train, arm, and finance a repressive and corrupt regime that opens fire on its own citizens and imposes destructive neoliberal policies will only cause more and more people to flee.